Developmentally delayed people of all ages — those recovering from organic or traumatic brain injuries — adults challenged by age-related memory loss — All can benefit from integrating large and fine motor activities into language and mathematic development or recovery. 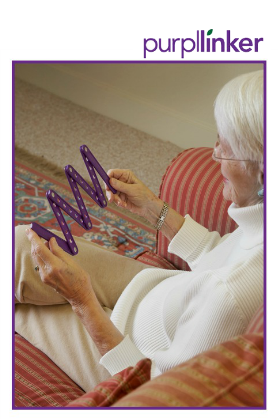 The Purpllinker is designed to mimic and manipulate alphabet and number shapes kinesthetically to enhance this process. It’s simple one-piece construction offers both mental and physical stimulation.